How do chromosome territory dynamics affect gene redistribution? The spatial organization of chromatin within the 3-dimensional space of a chromosome territory enables the co-localization of co-transcribed genes and their transcriptional foci. Many gene positioning studies have shown that individual genes often loop out of their chromosomal territory to co-localize with transcription factories. This often leads to interchromosomal compartments becoming enriched with intermingling chromatin loops, either from the same chromosome, or different chromosomes. It has been suggested that this repositioning can occur upon transcriptional activation . Measuring the diffusional motion of chromatin by sub-micrometer single-particle tracking, a characteristic confinement radius (significantly smaller than the size of the nucleus) can be determined for each locus. This demonstrates that, at least in yeast, centromers and telomers have a radii of confinement approximately twice as small as the rest of the chromosomal sites . The authors also showed that in yeasts and drosophila, chromatin constantly undergoes diffusive Brownian motion, constrained by confinement regions of gene loci, which rarely exceed 0.3 µm . Importantly, the repositioning of genes through chromosome territory dynamics is not always random, and the spatial redistribution of genes may involve specific nuclear structures or landmarks. This may have a significant effect on gene expression . Local compaction dynamics, long-distance interactions with alternative sections of DNA, and interactions with nuclear scaffolds  all play a role in the control of gene redistribution. Where interactions between DNA and nuclear scaffolds occur, anchor points , known as matrix attachment regions (MARs), are formed. Long-distance chromatin interactions may either involve the establishment of physical contacts between two sequence elements that are not adjacent to each other, but are present on the same linear chromosome (as is the case when enhancers interact with promoters), or between loci on different chromosomes . Importantly, with most interactions between loci occurring in only a small fraction of cells at any given time, long-range contacts are considered to be, at least in part, random, and are therefore difficult to predict . Despite these difficulties, it has been suggested that the nucleoskeleton is involved in the regulation of long-distance contacts. For example, Chuang et al. observed a fast (0.1-0.9 µm/min) long-range (1-5 µm) directional movement of transgenic chromatin arrays. Nuclear actin together with myosin – two important components of the nucleoskeleton – were proposed to serve as molecular motors that direct the movement of chromatin towards a given target region . This was supported when the movement of actin arrays was blocked by the expression of mutant nuclear myosin I or mutant actin. Moreover, with the actin mutant unable to polymerize, the looping of U2 snRNA genes towards coiled bodies was also abolished . Interactions between genes and nuclear landmarks also affect gene transcription. These landmarks, which are distinct nuclear regions, include the nuclear lamina (NL), nuclear pore complexes (NPCs) and the nucleolus (reviewed in ). The nuclear periphery is often found to preferentially interact with transcriptionally silent chromatin, which is characterized by a low gene density. It has been proposed that the nuclear periphery itself creates a specific environment that favors histone deacetylation and gene silencing . Indeed, in yeast cells (which generally lack nuclear lamin), gene silencing resulted from the tethering of a gene locus to the periphery . This suggests that in mammals, the nuclear periphery is heterogeneous, with microdomains of different compositions having different effects on genome function . Takizawa et al. proposed that simply being near the periphery without physically associating with the NL is not enough to induce gene repression. Nuclear pore complexes represent another distinct microenvironment; however, in contrast to the nuclear periphery this landmark is often associated with gene activation . In yeast cells, the highly transcribed ribosomal protein (RP) is connected with NPCs via the actin-related protein, Arp6 . Interestingly, interactions between chromatin and NPCs may take place both in and away from the nuclear periphery, making the dynamic movement of lamins and nuclear pore proteins integral to gene regulation . The exact dynamics that drive these interactions in the nucleoplasm remains poorly understood. 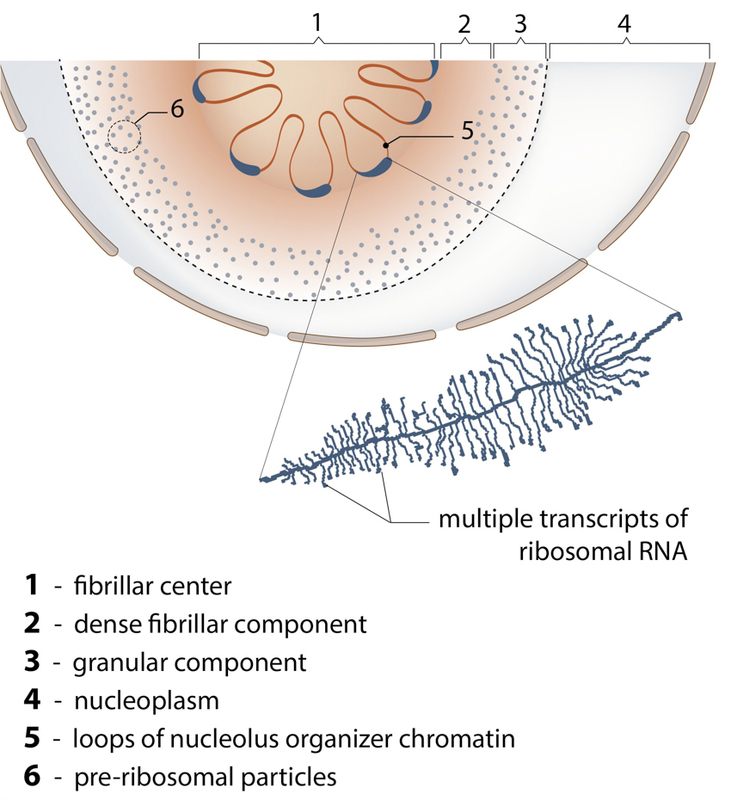 The main function of nucleolus is the synthesis of ribosomal RNA and assembly of ribosomal particles. Nucleoli are often enriched with centromeric satellite repeats and inactive gene clusters. The nucleolus may also anchor specific chromatin loci. In addition to rRNA genes, it often harbors large genomic regions (median size 750 kb) that are enriched in centromeric satellite repeats and inactive gene clusters. Centromeric regions are also found associated with nuclear lamina, suggesting that centromeres are distributed between the nuclear lamina and nucleoli . Despite the current evidence highlighting the influence of chromosome territory dynamics in the regulation of gene expression, little is known on the mechanisms behind these processes. For example, it is unclear how and why activated genes are translocated, or loop, from one chromosome territory to another. One plausible scenario involves the transduction of mechanical stimuli to the nucleus directly via the cytoskeleton. In such cases, cytoskeletal forces induce nuclear deformation (i.e., elongation or squeeze) and subsequently, alter chromosome topology and gene expression . The nucleoskeleton (i.e., nuclear actin and myosin) provides another mechanism to control the long-distance directional movement of genes , but this is likely to be restricted to specific genes, e.g. U2 snRNA . Currently, the extent to which genes move through active guidance as opposed to diffusion, remains unclear. How is DNA packed inside the nucleus? A series of processes must take place that enable the cell to package DNA within the confines of the nucleus whilst retaining its ability to transcribe and duplicate the entire DNA sequence and maintain its integrity. This is achieved through an elaborate process of DNA condensation that sees DNA packaged into 46 chromosomes (or 23 chromosome pairs) in humans. Read more.. The next step in the process of translation is termination. In this step an mRNA stop codon indicates that no additional amino acids are to be added to the growing protein. Read more..
How are ribosomes recycled during translation? The final step in translation is ribosome recycling, which sees the ribosome split into its smaller subunit parts and prepare for another round of translation. In eukaryotes this means the 80S ribosome splits into its 40S and 60S subunits. Read more..
What happens during the elongation stage of translation? Elongation occurs over several well-defined steps, beginning with the recognition of the mRNA codons by their corresponding aminoacyl-tRNA. Association with the mRNA occurs via the ribosomal A site and is influenced by various elongation factors. Read more.. The first step in translation is known as initiation. Here, the large (60S) and small (40S) ribosomal units are assembled into a fully functional 80S ribosome. This is positioned at the start codon (AUG) of the mRNA strand to be translated. Read more.. Translation is a process that involves the synthesis of an amino acid chain from an mRNA blueprint. These polypeptide chains fold into functional proteins. Read more..
What is euchromatin and heterochromatin? Traditionally, chromatin is classified as either euchromatin or heterochromatin, depending on its level of compaction. Euchromatin has a less compact structure, and is often described as a 11 nm fiber that has the appearance of ‘beads on a string’ where the beads represent nucleosomes and the string represents DNA. In contrast, heterochromatin is more compact, and is often reported as being composed of a nucleosome array condensed into a 30 nm fiber. Read more.. Despite 20,000 genes being present in each haploid nucleus, the number of transcription foci is limited to around 2000. These transcription foci, also known as transcriptional factories are distinct submicron nuclear regions that are associated with nascent RNA production and are enriched in RNA polymerase II (RNA pol II) complexes. Read more..
Telomeres are short nucleotide sequences found at the end of linear chromosomes which protect the genetic information. In vertebrates, telomeres have the hexameric sequence TTAGGG. Read more..
What are the various models describing the structural organization of chromosome territories? With the development of high-throughput biochemical techniques, such as 3C (‘chromosome conformation capture’) and 4C (‘chromosome conformation capture-on-chip’ and ‘circular chromosome conformation capture’), numerous spatial interactions between neighbouring chromatin territories have been described. Together, these observations and physical simulations have led to the proposal of various models that aim to define the structural organization of chromosome territories. Read more..
How is transcription regulated in stem cells? Embryonic stem cells are pluripotent in early organism development, but gradually undergo lineage restriction and transform into the stem cells with limited differentiation capacities (e.g., hematopoietic stem cells, neural stem cells). Read more..
How is the nucleus maintained in a prestressed state? As an integral part of cellular behavior, cells are sensitive to matrix rigidity, local geometry and stress or strain applied by external factors. In recent years, it has been established that an extensive network of protein assembly couples the cytoskeleton to the nucleus and that condensation forces of the chromatin balance cytoskeletal forces resulting in a prestressed nuclear organization. Read more..
What are the stages in DNA replication? Cells must replicate their DNA before they can divide. This ensures that each daughter cell gets a copy of the genome, and therefore, successful inheritance of genetic traits. DNA replication is an essential process and the basic mechanism is conserved in all organisms. Read more..
How does chromatin remodeling regulate gene transcription? While chromosome territory dynamics is believed to regulate gene expression through the redistribution of genes and the subsequent co-localization of these genes with transcription machinery, changes are also commonly made to the chromosome structure at a ‘local’ level. Although these changes do not necessarily involve the redistribution of genes, they do have a significant influence on gene regulation. Read more..
How do chromosome territory dynamics regulate gene expression? The spatial organization of chromatin within the 3-dimensional space of a chromosome territory enables the co-localization of co-transcribed genes and their transcriptional foci. Many gene positioning studies have shown that individual genes often loop out of their chromosomal territory to co-localize with transcription factories. Read more..
What is the chromatin polymer model of chromosome territory organization? What is the Fraser and Bickmore model of chromosome territory organization? What is the interchromatin network (ICN) model of chromosome territory organization? What models describe chromosome territories? During interphase, each chromosome occupies a spatially limited, roughly elliptical domain which is known as a chromosome territory (CT). Each chromosome territory is comprised of higher order chromatin units of ~1 Mb each. These units are likely built up from smaller loop domains. Read more.. In order to fit DNA into the nucleus, it must be packaged into a highly compacted structure known as chromatin. In the first step of this process DNA is condensed into a 11 nm fiber that represents an approximate 6-fold level of compaction. This is achieved through nucleosome assembly. 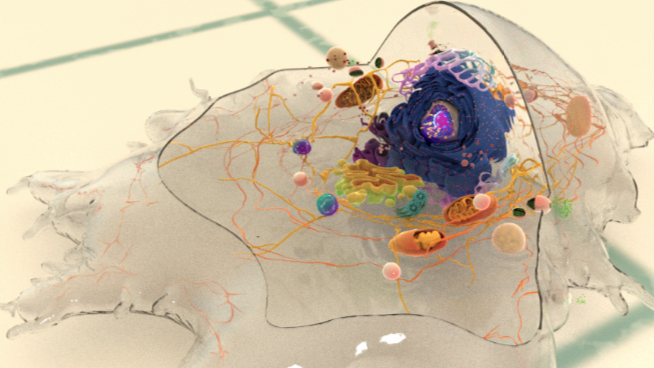 Read more..
How does the cytoskeleton influence nuclear morphology and positioning? How does the cytoskeleton couple the plasma membrane to the nucleus? How is the organization and function of the genome regulated? What are intermediate chromatin structures? Despite the extensive knowledge already gained on the structure of the 11 nm nucleosome fiber, as well as metaphase chromosomes, the intermediate chromatin structures commonly described are largely hypothetical and yet to be observed in vivo.Two popular models that were proposed based on in vitro data are the solenoid and zigzag. Read more..
What are chromosomes and chromosome territories? What is chromatin, heterochromatin and euchromatin?